Here, I will actually perform the steps that Bill Geary explained on the previous page. 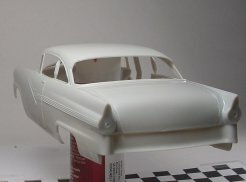 Since I was not prepared to make this a how-to on opening doors, I cheated and chose AMT/Ertl's recently re-released 1956 Ford kit. This kit comes with opening doors, so cutting them open and hinging them is not necessary. However, the kit relies on a plastic to plastic fit to keep the doors closed. I used Bill's latch technique to make the doors close with a satisfying "click". 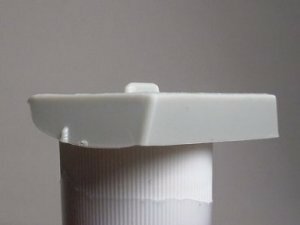 Here is the heart of this "tutorial", a watch strap pin. You may recognize it as the little part that held the strap onto your watch.....before it mysteriously disappeared that is. This one came from a non-functional watch that I happened to have laying around, but you can buy them new as well. 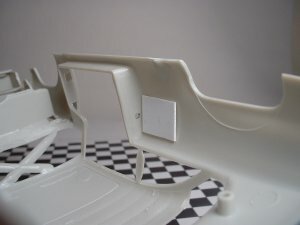 This shows the door jamb area on the AMT kit used for this article. Already having the opened doors saved a lot of work. I am saving opening doors for a later article, as it is fairly involved and I have yet to do it sucessfully. If you are opening your own doors, you will have to build the jamb area on your doors and body. The area for the striker is already present on this body, this is where the hole will be drilled for the latch pin. Here is the kit door panel. 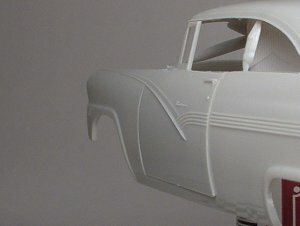 The triangular bump is what holds the door closed on a kit built straight from the box. The first order of business is to get the door fitted to the opening. Straight out of the box, the AMT kit has some problems with the fit of the door. A bit of sanding is needed around the edges of the door, and removal of all of the molding flash. With any body, make sure the door and the opening match as perfectly as possible. Here, the lower rear corner of the door is squared off, while the opening is rounded. 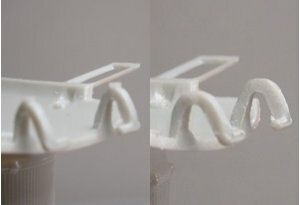 The kit hinges also have bumps left on them (on the left in the picture), presumably from the ejector pins in the mold, that must be removed. The door on the right, in the picture, shows what the hinges looked like after clean-up. 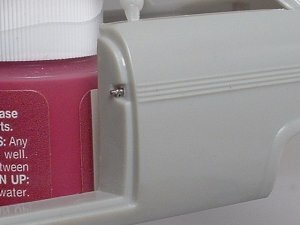 Whatever hinge you use, make sure that it allows the door to close flush, and does not interfere with any other part of the car (interior tub, firewall, etc.). 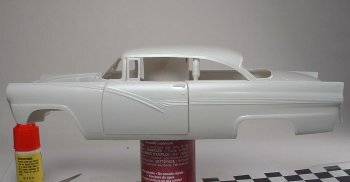 The goal is for the door to fit well in the opening, and flush with the body - all the way around. Here is what my body looked like after sanding the door and hinges to eliminate interference. Now the fun begins. After deciding where I wanted the latch to be located (an easy choice in this case), I drilled a 1.5mm hole through the body. 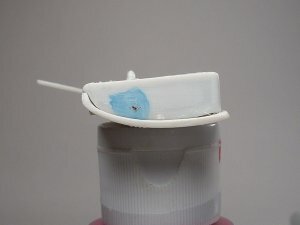 This will allow the end of the pin to extend through the body, but keep the outer tube of the pin from sliding through. If you were adding the latches to doors you opened yourself, it would be best to line up the assembled door and drill through both the jamb and latch area of the door. That's what Bill recommends, that's what I'd recommend. 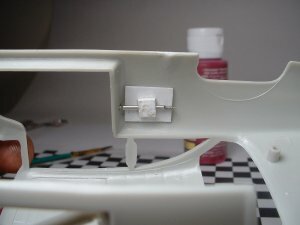 A piece of plastic needed to be added to the body to allow the pin to line up with the hole. I used a piece of .040" Evergreen sheet, cut to bridge enough of the body to allow the pin to line up with the hole. It took a few cuts to get it just right. Since it won't show, I simply cut the sheet with a pair of scissors and super glued it into place. 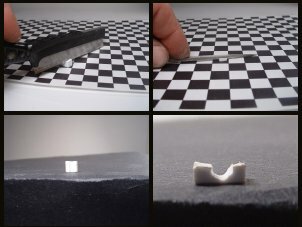 Next, a retainer for the pin was fashioned from 1/4"x1/4" Plastruct. I used a razor saw to cut a 3mm length from the end of the Plastruct rod, and, after cleaning it up with a file and sanding stick, cut a groove into it with a needle file. This groove will hold the pin tightly to the plastic strip inside the body, while still allowing it to move for adjustment of the latch. The retainer was then clamped in place (with the pin also in place), making sure that the pin was aligned with the hole in the jamb. Once I was sure that everything was aligned the way I wanted it, the retainer was attached to the body using liquid cement. 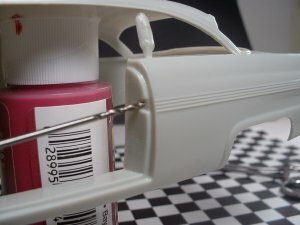 Using super glue would risk gluing the pin permanently into place, whereas the liquid cement melts the plastic and does not affect the pin or it's movement. Here is the door jamb with the latch pin in place. To me, the pin does a decent job of replicating the 1:1 pin - and it's functional too! Here it is from the inside of the body. Not the cleanest work around, but it will never be seen once the car is assembled. 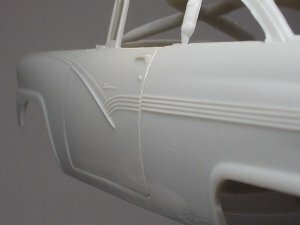 The door panel was assembled to the door skin, using normal techniques (sand to fit and super glue in place). 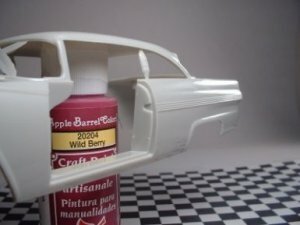 The "jamb area" of the door was then given a light coat of acrylic paint and allowed to dry. After the paint had dried, the door was put in place on it's hinges and opened and closed a couple of times. The pin rubbing on the paint left a line that showed it's placement. 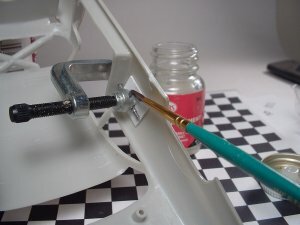 This line (and it's stopping point) were used to determine where the hole would be located on the door panel, shown here marked with black ink for clarity. A 1mm hole was drilled into the door panel, in the center of this dot, to give the pin something to "grab". 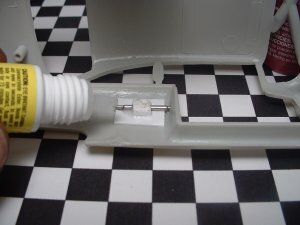 After a couple more test fittings, opening and closing the door and adjusting the latch for smooth operation, the pin was secured in place with a drop of super glue. Be careful that you don't get superglue anywhere near the working end of the pin, as it will lock it into place and the latch will not function properly. Here is a close up of the finished door. The latch pin also helps align this door better in it's opening. I guess the spring pressure from the watch pin pushes the door forward and up in this case, which is just what it needs! A big thank you to Mr. Bill Geary for this tip! It is not at all hard to do! The one thing I cannot demonstrate here is the neat click when the door opens and closes. 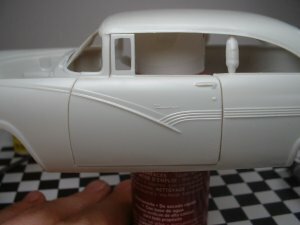 It is a very satisfying little project that really adds a neat touch to a model car.